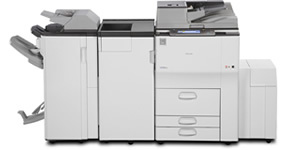 The new Ricoh Aficio MP9002SP is the mid range powerful all in one system that offers an amazing output speed of 75 pages per minute and colour scanning at up to 90 originals per minute. The Ricoh Aficio MP9002SP is the true multifunctional version of the MP9002 with Network Scan and Print pre-installed. The Ricoh Aficio MP9002SP offers the following features.